HOW LONG DOES IT TAKE BETWEEN ORDERING AND RECEIVING MY ORDER? If you require your order sooner please contact me to discuss, I will always do my best to try and accommodate you and your needs. HOW IS EACH PIECE OF JEWELLERY MADE? The majority of the designs are hand crafted, meaning I saw, stamp, sand, solder and polish each piece by hand. Some discs are bought in pre-cut shapes to help speed up production time and therefore keep costs down. Your chosen text is stamped into the metal one letter at a time, using a hammer and individual letter or number stamps. Despite my perfectionist nature, you may find that there is slight variation in letter depth, alignment and spacing, creating the true hand crafted look. WHAT METALS ARE USED IN YOUR JEWELLERY? I use quality metals in my jewellery range. Most of my designs are created in Sterling Silver (925). I also use Gold Filled, otherwise known as Rolled Gold. Gold Filled is 14KT Gold pressure bonded onto a base metal, usually brass. The Gold layers with Gold Filled pieces are 1000’s of times thicker than that used with Gold Plating and therefore it is said to not flake or rub off. Other options within my range include Brass, Copper and Nickel Silver. CAN I DESIGN MY OWN PIECE? Of course! I absolutely LOVE creating “one-offs” and helping people turn their design ideas into a special piece of jewellery to be treasured forever. I am happy to work through a process with you and create mock pictures and/or designs to help you visualise the finished product. HOW MANY WORDS CAN FIT ON EACH PIECE? Within my product descriptions I have tried to list the number of characters (this includes letters and spaces) that fit on each design. If you are still not sure, please feel free to email me to discuss your thoughts. If you place an order and I feel that your chosen text may be too long, then I will email you to discuss some options for you. CAN I ORDER FOR A FRIEND AND GET IT SENT DIRECTLY TO THEM? Yes absolutely, just be sure to put your friend’s address as the delivery address. I am happy to add a little complimentary note too if you wish. If so leave details in the comment box when placing your order. DO YOU HAVE A SHOP? CAN I PICK MY ORDER UP? I work from my home studio in Muriwai Beach. I do not have a shop front and as items are made to order I hold very little in the way of finished pieces for you to view. I am however happy for you to visit to view the pieces in their raw state to allow you to get a “feel” for what a piece may look like. I am also happy for you to collect your order from here should you prefer. IF I PLACE A BULK ORDER, WILL I BE ELIGIBLE FOR A DISCOUNT? If you are interested in placing a bulk order, please email me so we can discuss your options. DO YOU ACCEPT LAY BUY? Yes I do. I am very flexible in regards to repayments, however your piece is not created until the amount owing is paid in full. Email me to discuss your needs. I DON’T KNOW WHAT THE BIRTHSTONE FOR MY BIRTH MONTH IS. No worries. 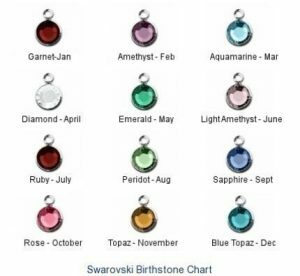 With products that have birthstones I have listed both the month and the corresponding birthstone. Also see the colour chart below. I CAN’T QUITE UNDERSTAND THE SIZE OF THE DISCS. 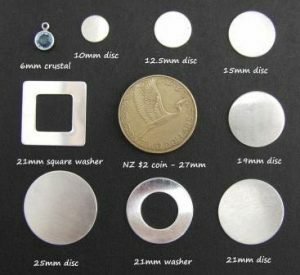 When I first started creating my range I too found it hard to “picture” how big a certain size disc was. Despite getting my tape measure out I still found it tricky. Hopefully this picture will give you a better idea. WHY HAS MY PIECE TARNISHED? Tarnishing is a natural process caused by oxidation of the metal, i.e., when a metal such as Sterling Silver, Brass and Copper come into contact with air and moisture they will lose their lustre over time. 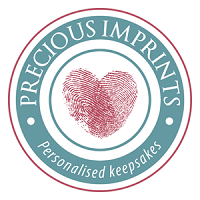 This can be minimised by placing your jewellery in an airtight bag when not wearing it. Avoiding wearing your jewellery while showering, sweating, swimming, spraying perfume or using household cleaning products will also minimise this occurrence.